All the face painting products we sell are skin safe and hypo-allergenic and have thorough rigorous safety checks. 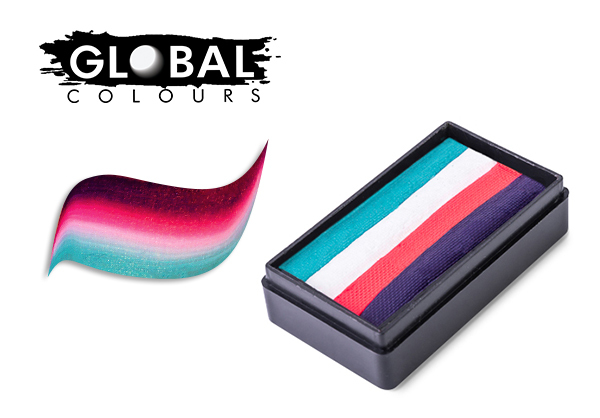 (Global Colours) and (TAG Body Art) face paints have the latest most up to date ingredients. These (face paints) are so easy to use, all you need is a wet brush and/or damp sponge. Paraffin Wax,Petrolatum, Glycerin, Calcium Carbonate, Stearyl Alcohol, Sodium Benzoate, Acacia senegal Gum, Dextrin, Water. May contain: Mica (Cl77019), Titanium Oxide (Cl77891), Iron Oxides (Cl77491), D&C Red 7 (Cl15850;1), D&C Red 6 (Cl15850), D&C Black 2 (Cl77266), FD&C Yellow 5 (Cl19140), FD&C Blue 1 & D&C Blue 4 (Cl42090), Ultramarines (Cl77007), Bismuth Oxychloride (Cl77163). Manufactured with FDA approved ingredients. Conforms to ASTM D-4236 & 76/768/EEC. Some products include perfume (Hydroxy-methylpentycyclohexenecarboxaldehyde). Manufactured with skin safe ingredients. Contains small parts that could cause choking hazard. Discontinue use if rash or irritation develops. Avoid contact with fabrics. Remove with soap and water and/or wet wipes, some trace of colour may remain after washing. Makeup contained in these paints is hypo-allergenic and non toxic. Manufactured in China for TAG Body Art. The manufacturer offers no guarantee and excludes himself/herself and the business, Face Paint Warehouse, from claims or warranties outside the use of its correct application. Staining may occur, wear suitable clothing. "Global Colours" Body Art was the official face and body paint for the Opening and Closing ceremonies of the Sydney 2000 Olympic Games. INGREDIENTS: Chemical CAS Number, Water 732-18-5, Calcium Carbonate 471-34-1, Acacia Senegal Gum 900-01-5 ,Glycerin 56-81-5 Methyl Paraben 9-76-3 (newest batches are made without parabens according to the manufacturer and labels) May contain: Iron Oxides CI7491, Titanium Dioxide CI7891, FD&C Yelow 5 CI19140, FD&C Red 40 CI16035, FD&C Blue 1 CI42090, Ultramarines CI707, Mica CI7019.Manufactured with FDA aproved pigments. Conforms to ASTM D4236, USP 61 Microbial imits tests, US California Prop 65 and CE-EN71 part 3: 194. All ingredients in this preparation are listed in the Australian Inventory of Chemical Substances (AICS). "Global Colours" range of products meet the standards set by US California Prop 65, ASTM D-4236 norms, FDA Regulations, European Regulations (CE-EN71 part 3:1994, EEC – 88/377 & 76/768), and has been tested for Metal Impurities and Hypoallergenic Properties by independent Australian laboratories. 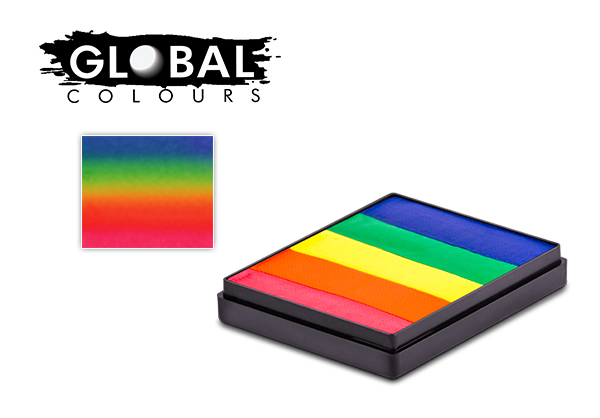 All "Global Colours" products are GMO free and BSE Free according to statements issued by suppliers. Aqua, AcrylatesCopolymer, PEG-400, Propolene Glycol, Hydroxyethel Cellulose, Propylparaben, Methylparaben, Diazolidinyl Urea, Polyethylene Terephthalate, Aminomethyl Propanol. Ultramarines, FD&C, Yellow No.5 (Cl19140), FD&C Red No.40 (Cl16035), FD&C Blue No.1 (Cl42090), D&C Red No.7 (Cl15850), D&C Orange No.5 (Cl45380), D&C Red No.21 (45380:2), D&C Red No.27 (45410:1), Yellow No.7 (45350:1), Iron Oxides. 1300 Face Paint makes no warranties of any kind, expressed or implied, including any warranty of merchantability, fitness of the product for any particular purpose or any warranty relating to patents, trademarks, copyrights or other intellectual property. 1300 Face Paint shall not be liable for any injury, loss, damage, or loss of profits resulting from the handling or use of the product shipped. Refunds will be given at the discretion of the management. 1300 Face Paint and the owner of Face Paint Warehouse offer no guarantee and excludes herself/himself/themselves and the business from any claims or warranties of all products purchased from or supplied by 1300 Face Paint . Some paints may stain clothing, wear suitable clothing. 1300 Face Paint warrants its products against defects in materials and workmanship for a period of 14 days. If, within 14 days of receiving your product, you discover a defect, 1300 Face Paint will, at its discretion, repair, replace, or refund the purchase price. This warranty will not apply if the product has been intentionally damaged, modified or altered in any way. If, within 7 days of receiving your product, you find that it does not suit your needs, you may return it for a refund of the buying price. ​1300 Face Paint will refund the purchase price of the product in the same payment form, excluding shipping/handling costs, once the product is received. This refund will not apply if the product has been intentionally damaged, modified or altered in any way.